Speaking as a former political refugee, the United Nations has failed in its structural integration of humanity as a dominant socialist utopia. I came to this country as a political refugee from Cuba after suffering horrendous persecution under Castro’s Communist regime. Members of my family were imprisoned, tortured and executed. Growing up under the despotic military dictatorship of Fidel Castro led to my experience as a political refugee in the United States. There is no way to compare the current situation of the refugee crisis overwhelming Europe with the refugee program that embraced my family and I in the United States. Even though it is well known that Cuban spies infiltrated the Cuban political refugee program at the time that my asylum took place (they still do! )– it is also evident that Cuban refugees were not attacking American citizens on our own soil in acts of violence representing the Castro regime. 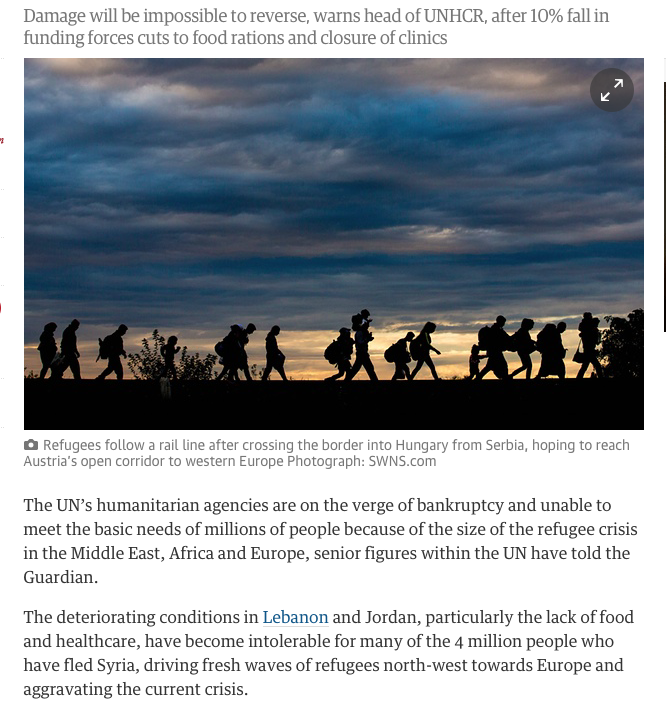 Having said this, I’d like to address the truth about the ineptitude and farcical nature of the United Nations vis-à-vis the refugee / migrant crisis in Europe: it is patently clear that the United Nations has failed again. After all, most (if not all) of the refugee camps in Europe are relying on private organizations to rescue and keep refugees / migrants alive. After so many treaties, proclamations, expressions of indignation and empty rhetoric– where is the United Nations when you need them? Why aren’t they creating safe zones overseen by their representatives wearing their little blue berets in the war-torn regions of the Middle East, so that refugees can remain in their homelands? What’s happening with the obscene amount of taxpayer money that the United States gives annually to the United Nations? Why is it that the United Nations, as the most powerful socialist entity in the world, is incapable of creating safe zones for these refugees? Is it that the UN member countries do not want to cooperate? Is it that when it comes to human rights– the biggest chunk of the money is going to population control and the undermining of traditional marriage and family in places like Sub-Saharan Africa, which for the most part vehemently rejects this type of UN agenda? What about all the international treaties that were supposed to kick into place during a catastrophic human crisis– such as the one Europe faces with the refugees / migrants? The truth is that the United Nations has failed in its structural integration of humanity as a dominant socialist utopia. It is also true that ethnic identification, socioeconomic status, religious and political background are extremely difficult to assess at check points flooded with thousands of persons who may be carrying false documents– or none at all. But isn’t this what the United Nations was supposed to solve? After all, these socialists operate under the name “United Nations”! It is a fact that European countries and the United States do not have in place a hierarchic system of geographical, statistical and demographic data that can address the current refugee / migrant crisis from the Middle East, in order to ensure the safety of the citizens of host countries. In contrast to the scenario of the Middle Eastern refugees, I came to this country as a political refugee from Cuba as part of a cohesive group that shared a common identity. We were anti-communists who wanted to assimilate into American society as productive and peaceful citizens. This is not the case with the current refugees / migrants, among which are those who support Sharia Law and other customs that are incompatible with the Commandments of God and the Natural Law– which are the basis of Western Civilization. Tragically, the Christians of the Middle East, whose values are based on the Commandments of God and the Natural Law, are being beheaded and exterminated while politicians in Washington DC and in the United Nations worry about those who believe in Sharia Law! Yes, I’m sure that some (or many) of these refugees / migrants are Muslims fleeing Islamic extremism– but there is an undeniable fact: by identifying as Muslims they are directly or indirectly (depending on the degree of their fervor) supporting Islamic law, which is Sharia Law– as the framework within which public policies and some private aspects of life are regulated for those living in a legal system based on Islam. No degree of political correctness can hide this! This leads to the following question: why is it that the United Nations has failed to convince its Muslim members / leaders that Sharia Law is incompatible with the UN’s socialist utopia? My heart goes out to the little children who desperately need to be rescued– and are caught in the violence of the Middle East and other regions where Islamic extremism is prevailing. It is time to put pressure on inept political leaders so that truly innocent people can be saved during this crisis. The only safe solution, both for authentic refugees and the citizens of countries under pressure to host them, is the creation of safe zones in the refugees’ countries of origin. But this requires true leadership– not romantic political correctness.